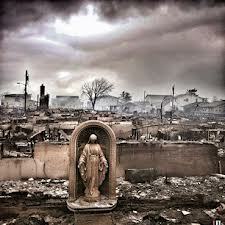 And here she is: Madonna presiding over the devastated remains at Breezy Point after Hurricane Sandy struck. The rest of the neighborhood is charred from fire and swept away from flooding, and somehow she remained intact and unscathed in her original location. To me her graceful, open posture reminds me of the capacity for stillness in the eye of a storm as well as the powerful, unbiased, compassionate witness to life’s unfoldings. No judgement: just peace amidst what painfully is. I dance the dance of surrender into the days of motherhood – 18 months in. The ‘aha’ moments slow down, making way for steadier rhythm of more predictability, a slow apprenticeship of descent and return – much like the walking journey in and out of a labyrinth. A whole cycle of transformation coming to completion, somehow waxing and waning like the moon cycles spread out into years. All of the sudden I take stock of truly being on “the other side” of massive transition. Unpredictability has ushered in evenness. Lessons coalesce. “I’ve settled in,” I suddenly realize, like skin sinking into sand on a beach, that same sensation of familiar returning to a rhythm of being and flow that only the edges shared with water can reflect. Suddenly there is space to see the labyrinth journey into motherhood from the outside – to gain a perspective different from the center; There is being in the fire so to speak (which pregnancy, birth and early motherhood often feels like) – and there’s a bird’s-eye view of where one has just been. Like an eagle’s 40 mile vision radius, it is now that time to take stock of soul’s journey in and soul’s journey out. I am forever changed having traversed the leap from ‘maiden’ to mother (to use the triple goddess lingo) in the progression of life’s generational dance. How we come out of transition into something new is just as important as simply marking the transition itself (neither of which my culture does particularly well). So now, the question arising: what is my next unfolding? 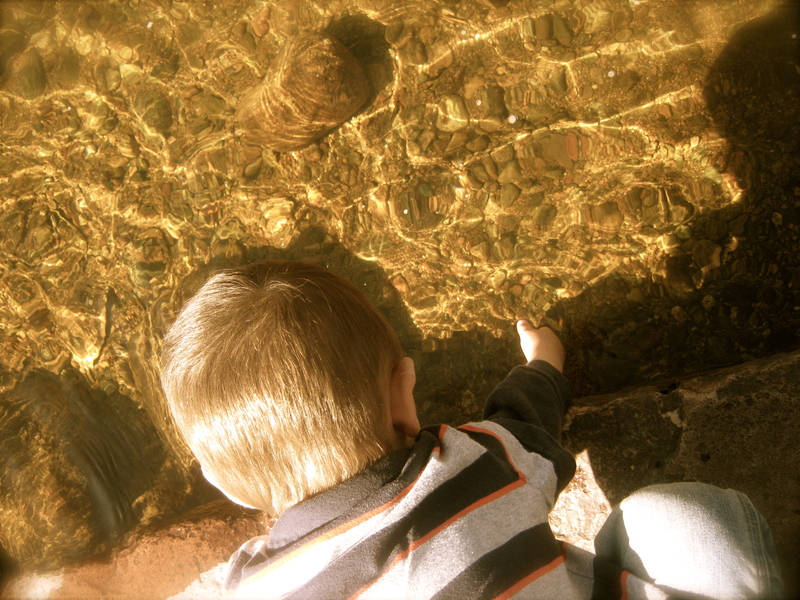 How will I integrate the lessons of becoming a parent into a next iteration on life’s path? All too often days blur, hours blur and routine dominates the slow folds between worlds in a lifetime. How many times have we heard “where did the time go?” How many times have I met a parent on the bus who tells me with a wistful expression “my child is 18 now and I don’t know where those years went.” 18 months or 18 years – we are constantly invited to mark the moments as sacred. So how can we make life’s moments of transition marked, sacred, noteworthy? Like a short (or long) carpet rolled out for ourselves, we can mark our transitions and transformations with clarity and reverence. Even if we don’t know what’s next, we can acknowledge the passage of time carrying us into new phases. Each one prepares us for a future unfolding, eventually death. The key is: do we pay attention? Just as pregnancy and birth took me on a profound crash course on letting go of body – a handing over of ego and ‘self’ to larger forces of creation and chaos beyond my control – so too will future transitions teach me the art of letting go and letting be what simply is. There is no better place for marking the sacred as in the present moment. Again and again we can ask how we can live life more fully and passionately? How can we integrate lessons learned into being the most compassionate mother or person? How can I hold on to my seat as a new person emerged from a rite of passage into parenthood? And, how to live into what is next with great intention when time for reflection feels scant? A friend once said “you can’t do anything about your desire to live closer to the Divine. All you can do is make yourself more available to Grace.” Just like light somehow splits open a seed, we can make ourselves available to grace in our daily actions, trusting that glimpses will emerge as guides. Sofia Diaz always reminded me in Yoga postures that “you can’t do it… let it do you.” Let yourself be done or undone. So too with the vicissitudes of parenting and soul’s ebbs and flows. Like a rock in water I’ve thrown myself into this stream of path, and now I must simply trust the tides as they do their work, aiming at least to marvel at life’s smoothing gestures of slow transformation.